Ustad (Professor) Ghulam Farid Nizami is of the Senia Gharana tradition and is a descendant of Mian Tan Sen, court musician of 16th century Moghal Emperor Akbar the Great. A 17th generation musician, he began apprenticing with his father, Ustad Ishaq Nizami at age 4. He continued his studies with his elder brother as well as other esteemed Pakistani maestros in sitar, vocals, tabla and harmonium. He received instruction in the tradition of Sufism from Khawaja Mohammad Moeen Khan Nizami and Haji Faiz Ahmed. Over 30 years of teaching at Pakistani institutions, Nizami has helped create a new generation of musicians. Among his students are the first professional female tabla and sitar players in Pakistan. In 2008 he came to the U.S. as a Fulbright Scholar and taught at The University of Texas in Austin from ’08-’09. He masterfully presents a vast array of styles including Classical Indian, Ghazal, Geet, Qawwali, Bhajan, Pakistani Folk and Sufi music. 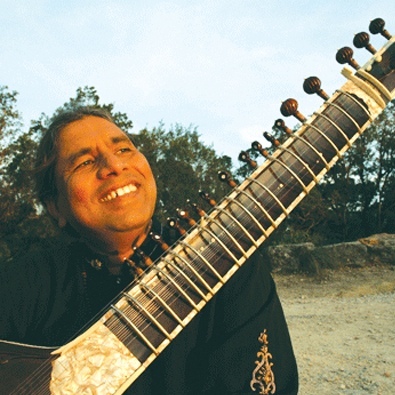 His principal instruments are Sitar, Vocals, Tabla, and Harmonium. After his father’s death, he continued his studies with his elder brother Ustad Mohammad Akhtar Nizami as well as other esteemed Pakistani music maestros in sitar, vocals, tabla and harmonium. Ustad Nizami created and hosted several educational television shows on Pakistan TV that featured the traditional music of North Pakistan, and has made innumerable radio and television appearances. He has worked extensively with the Folklore Museum at Lok Virsa in Islamabad and performed widely for the Pakistani National Council for the Arts for over 25 years. He has performed for Pakistani heads of State as well as for a long list of foreign dignitaries, including 3 US presidents, Saudi King Abdullah, Jordani King Hussein, Nelson Mandela, Queen Elizabeth and Princess Diana. In over 30 years of teaching at Pakistani educational and performing arts institutions, including 14 years at the Beacon House School, Nizami has helped to create a new generation of musicians.